The Galvin Center's premier project is the development of the nation's first Perfect Power microgrid at IIT. The $14 million project has equipped IIT's microgrid with a high-reliability distribution system for enhancing reliability, new sustainable energy sources (roof-top solar panels, wind generation units, flow batteries and charging stations for electric vehicles), and smart building automation technology (building controllers, Zigbee sensors, controllable loads) for energy efficiency and demand response. IIT is experiencing three or more power outages each year, at a cost of up to $500,000 annually in restoration expenses, lost productivity, and ruined experiments that often cannot be recovered. Its energy infrastructure is getting old and critical components are facing the end of their useful life. Demand for electricity to power the technology and research needs of its students, faculty, and staff is growing steadily. IIT will soon be renegotiating its wholesale contract with Constellation NewEnergy, as it expires in 2010. The Perfect Power System at IIT will be the first energy distribution system of its kind in the United States. IIT has partnered with the Galvin Electricity Initiative and the United States Department of Energy (DOE) to develop a comprehensive solution to this urgent situation-one that will reduce the time and money lost to power outages and meet IIT's growing, specialized energy needs. This partnership, in collaboration with S&C Electric, Endurant Energy, and ComEd, has developed a Perfect Power System design for IIT's Main Campus. This flagship system will confront and model-for other universities, municipalities, developments, and more-a solution to the nation's energy crisis. The Perfect Power System at IIT will position the university as a pioneer in electricity delivery and infrastructure. As an innovator of this approach, IIT will attract the attention of prospective students, alumni, the research community, the power industry, potential donors, federal and state agencies, and other important stakeholders. The Perfect Power System design at IIT will result in a power system that will not fail the end user. 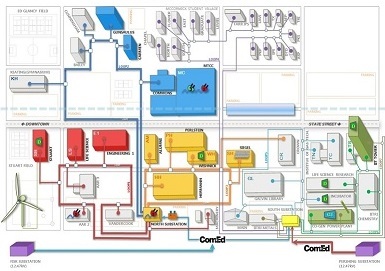 The system consists of smart microgrids featuring a loop system and redundant electricity. It will offer IIT the opportunity to eliminate costly outages, minimize power disturbances, moderate an ever-growing demand, and curb greenhouse gas emissions. The Perfect Power System will allow IIT to avoid costly system upgrades and realize efficiency savings well into the future. It is estimated that the system will pay for itself as it's built, over the next five years. The project is funded by IIT and the DOE with a total $12 million investment. $3.5 million of the total project funding will include research in advanced distribution automation and recovery systems, buried cable fault detection and mitigation, intelligent system controllers, and advanced ZigBee wireless. Perfect Power means not only a cheaper energy bill for IIT, but also a safer, more productive campus and the opportunity for IIT to set the standard for electric power delivery. Reduced need for scheduled upgrades - In addition to the savings listed above, Perfect Power will mean savings for ComEd and Illinois consumers, as it allows the utility to defer a planned $2 million upgrade to the Fisk substation. As noted, it will also eliminate the need for a new east campus substation that would otherwise cost IIT $5 million, for a total of $7 million in savings from avoided infrastructure upgrades. Reduced energy costs - IIT is projected to save approximately $500,000 to $1.5 million per year by reducing electricity peak demand, electricity usage, and providing ancillary services to the grid. IIT can also reduce costs by purchasing a portion of its electricity in real time. In addition, IIT will save transmission and distribution charges and taxes. Improved power reliability and quality - With the Perfect Power System, cable failures will be automatically isolated and power rerouted to prevent local building outages. Onsite generation combined with demand response will allow the campus to continue to operate in the case of an interruption in ComEd supply. Create a greener campus - The Perfect Power System will help IIT achieve its Energy Action Plan objectives- including significantly reducing CO2 emissions and improving efficiency in electricity use by 20 percent-by reducing peak demand, distributing energy more efficiently, and leveraging solar and other renewable resources. IIT is positioned as an electrical engineering innovator - Perfect Power will position IIT as a living laboratory for the most advanced distribution system concepts and control technologies, providing a powerful resource for attracting students and government/ industry funding. Expanded research and education grant opportunities - IIT's Department of Electrical and Computer Engineering plans to attract additional grants and philanthropic support, in excess of $1 million per year, due to the added campus features and functions of the Perfect Power System. The societal benefits of the proposed $3.5 million research on Perfect Power is viewed to be substantially higher once the proposed research results are replicated throughout the U.S. Improved campus safety and security - The Perfect Power System will provide IIT with a significantly more robust energy system that can respond to weather, aging, and other threats, ensuring power to students, teachers, and tenants during emergencies. The system will also enhance IIT personnel safety due to the automation of manual high voltage switches.